Its that time of year when we open up our scholarship program for all your kids to apply! Thanks to our generous telephone companies and associate members that donate to the WITSA fund we are able to give away thousands of dollars a year. Below you will find the new updated application along with the instructions. If you would like to make a cash donation to WITSA to help fund a scholarship award, please email Shellie@shellieburnham.com for an invoice and click on the Donate button below. Special thanks to sponsors Skip Haynes; ITA Showcase; Johnson, Stone & Pagano, P.S. ; Ramsey Scholarship Endowment; Whidbey Telecom; and WITA members who contributed and purchased items at the annual scholarship auction! 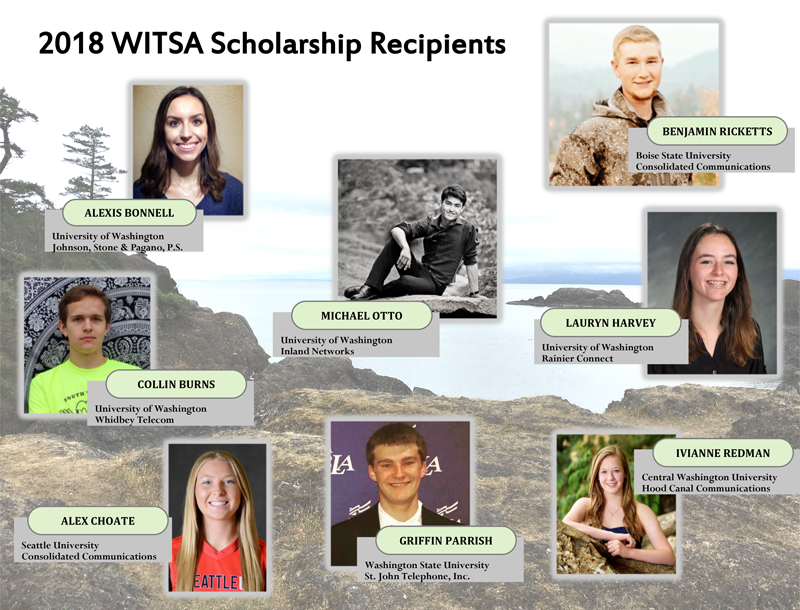 If you would like to make a donation to WITSA to help fund a scholarship award, please email Shellie@shellieburnham.com. Thank you for your support of WITSA! The award is presented annually in appreciation for outstanding contribution to the Washington Independent Telecommunications Association. The award is presented annually in appreciation for outstanding service to the telecommunications industry, and support of the Washington Independent Telecommunications Association.